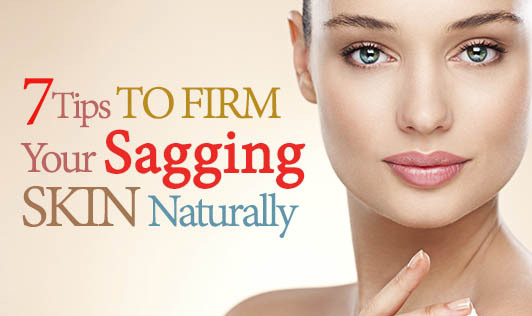 As you grow older your skin begins to lose its elasticity causing it to sag or droop. This is more evident around the eyes, mouth, cheeks, jaw-line, and neck. But bawling over sagging skin will never help. What you can do is, follow these simple, natural skin-tightening tips to look younger and beautiful. Egg-white with thyme oil is a very effective cure for sagging skin and wrinkles. Egg-whites help in the production of collagen and thyme oil helps to rehydrate skin. Together, they help you tighten loose skin effectively. A face mask made from mashed ripe banana, 1 tablespoon of honey, and 1 teaspoon of olive oil, helps to firm sagging skin and give it an instant glow. It helps to regulate sebum production and locks in the moisture that helps to lift the sagged skin. Mix turmeric and water together to make a paste, apply the paste evenly on the face, let dry for 15 minutes. Rinse off with cold water. You need to apply turmeric paste on a weekly basis to ensure that your skin gains back its elasticity. Make a paste of strawberry and yoghurt and apply it on the face. Keep the mask on for 15 to 20 minutes and wash. The mask acts as a toner and helps to tighten drooping skin. It also improves blood circulation and lends a fresh, new look to the face. Apply some fresh tomato juice on your skin in a gentle circular motion. Do this for about 5 minutes and then rinse off with cold water. Regular application of tomato juice will help you tighten your skin, reduce pores, and make your skin look bright and beautiful. Sandalwood face mask exfoliates and tightens your sagging skin, while giving you a natural glowing look. It also helps to keep away acne, spots, sweat, oily skin, and more. Instead of using the sandalwood powder, it is advised to use the natural stick. All you need to do is dip the stick in water and rotate the stick on solid mortar to make the paste. Take a long hot bath with sea salt. Sea salt helps to firm the skin and improves overall skin tone. Make sure you drink enough water while you do so to prevent dehydration. So get ready to rejuvenate your skin and look as young as ever with these brilliant tips!